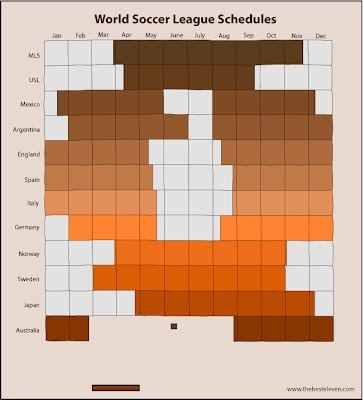 A chart showing the times of the year that various world soccer leagues take place. I'm glad MLS takes place through the summer, although from reading message forums many MLS fans seem to disagree. It allows for a year round club soccer fix, and in the US it doesn't compete with as many sports as it would in the Fall and Winter. I just wish they'd take a couple of weeks off during the big international tournaments in mid-summer. I had to throw in the old school video game reference when I saw what the chart looked like. What was the name of that game again? I believe you're thinking of either Breakout or Arkanoid. I must have been thinking of Breakout since Arkanoid came out in 1986 and by then I'd moved on to high-tech NES games like Duck Hunt and Super Mario Bros. Now I'm going to have to dig my Atari 2600 out of the attic.